North Suffolk is a lattice of lanes, which meander as if they are so ancient they have forgotten their purpose. Worlingworth is a large village, and it comes as a surprise. 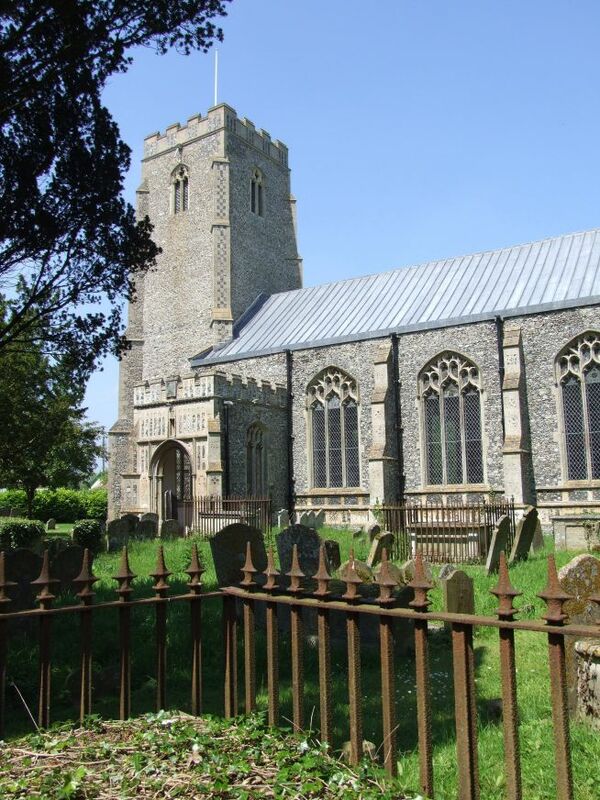 The church of St Mary rears its 15th Century head above the pretty cottages, and you step through a gate into the tight, verdant graveyard. From here, the sheer scale of the Perpendicular windows is accentuated by the lack of a clerestory. You can see straight away that this is not going to be a dark church. 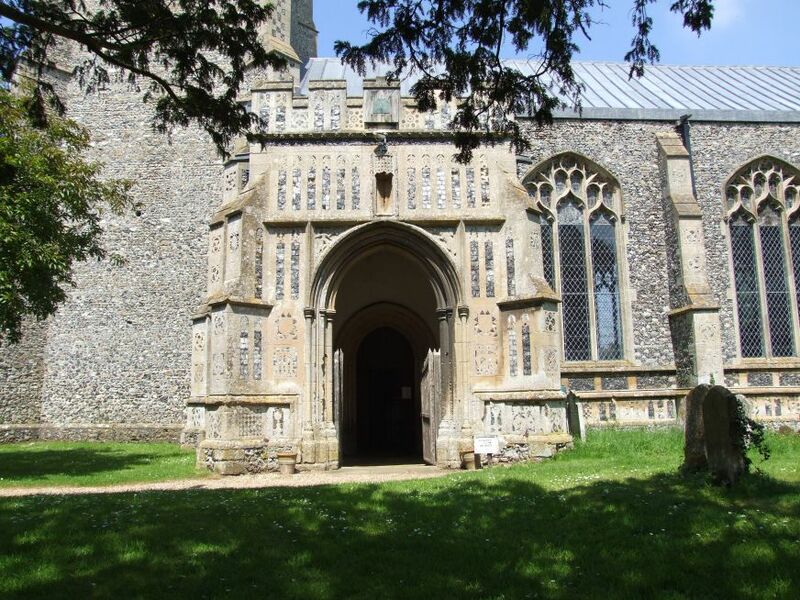 The porch disguises the size of the church, being large in proportion. 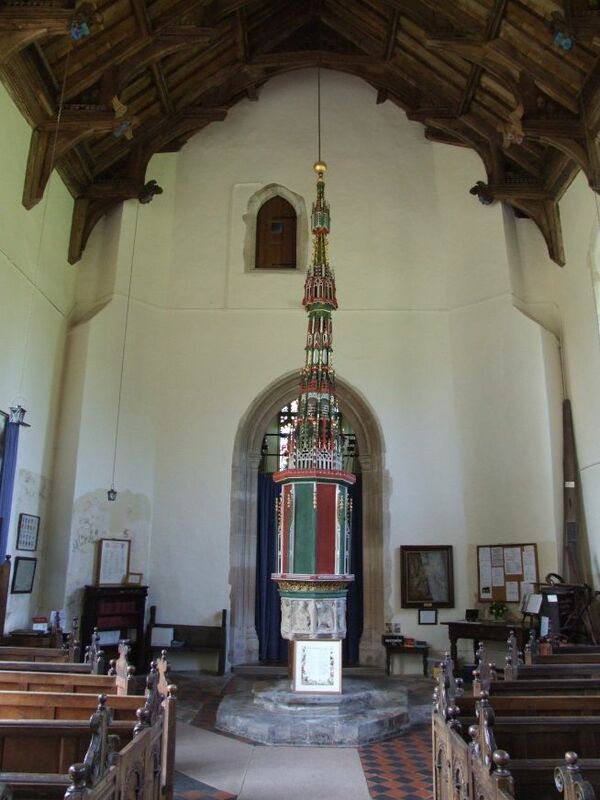 In fact, as there are no aisles, this is the second largest span of any church roof in Suffolk, after Laxfield. 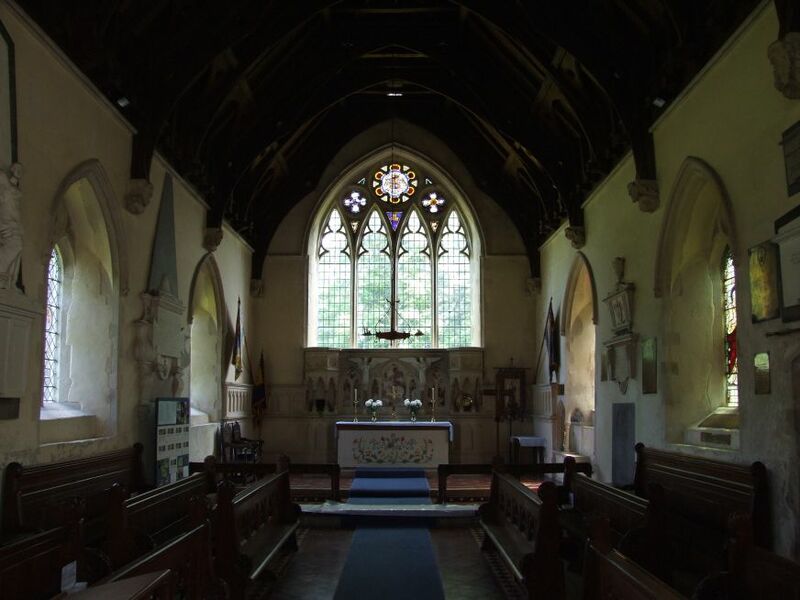 As is usual in this part of the county, St Mary is open every day, and it is always a pleasure to step into the charming and interesting interior, with much to see. 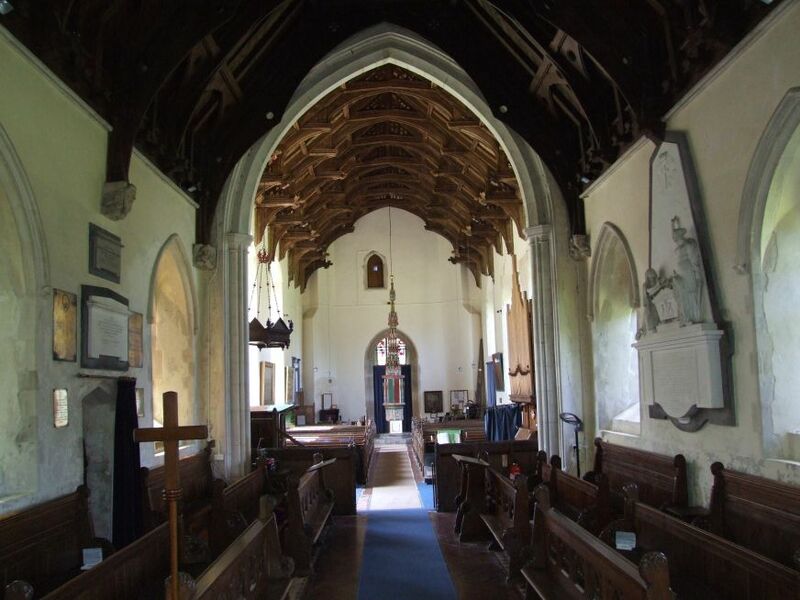 Simon Jenkins famously described the parish churches of England as one vast folk museum, and he might well have been thinking about Worlingworth in particular. 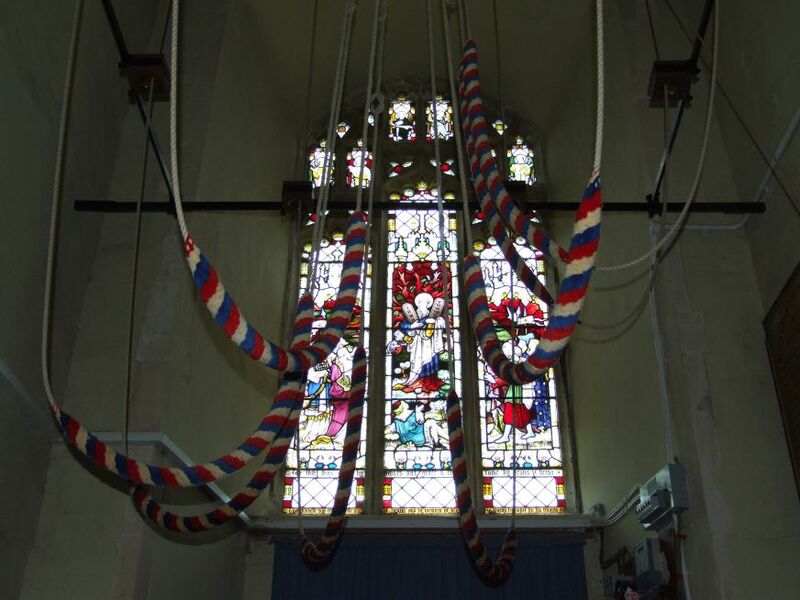 Here, there is a real sense of the life of ordinary people in this parish over six centuries or more. 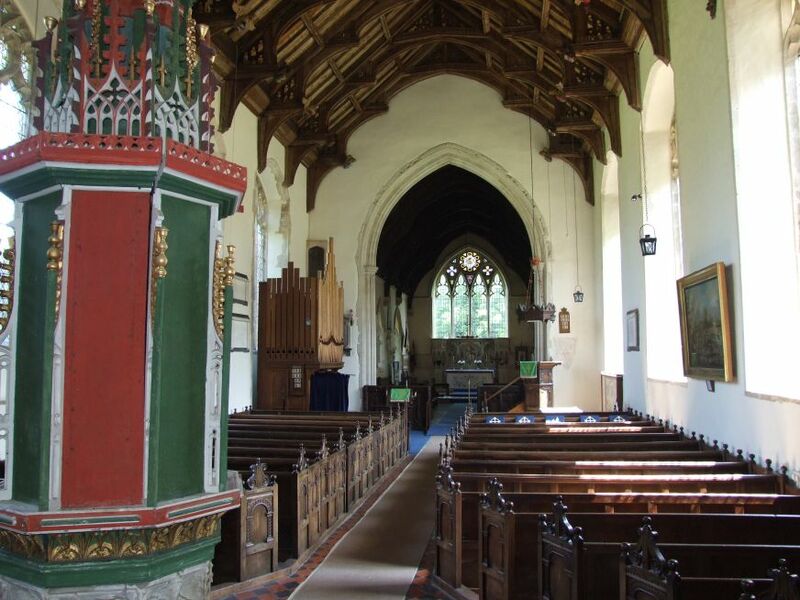 Best of all is quite the loveliest set of 17th century box pews in the county. Their doors are carved with the familiar arch, the wood burnished with the patina of age. The date 1630 can be seen at the front. 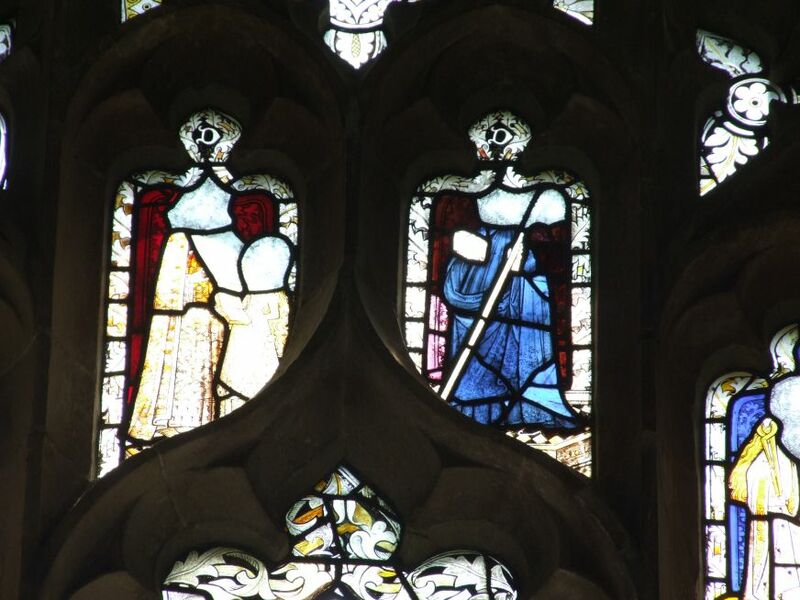 Their sheer quality is perhaps a mark of burgeoning Laudian piety, but undoubtedly they serve their purpose so well that no later century has seen a reason to replace them. The effect of standing among them beneath that great roof is a little like being in a forest. 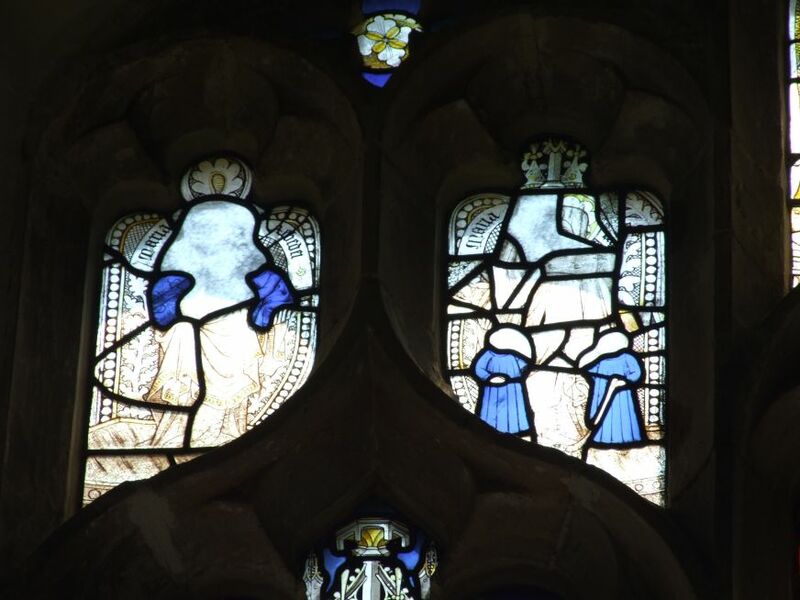 Some medieval fragments of glass survive in a nave window and in the upper lights. 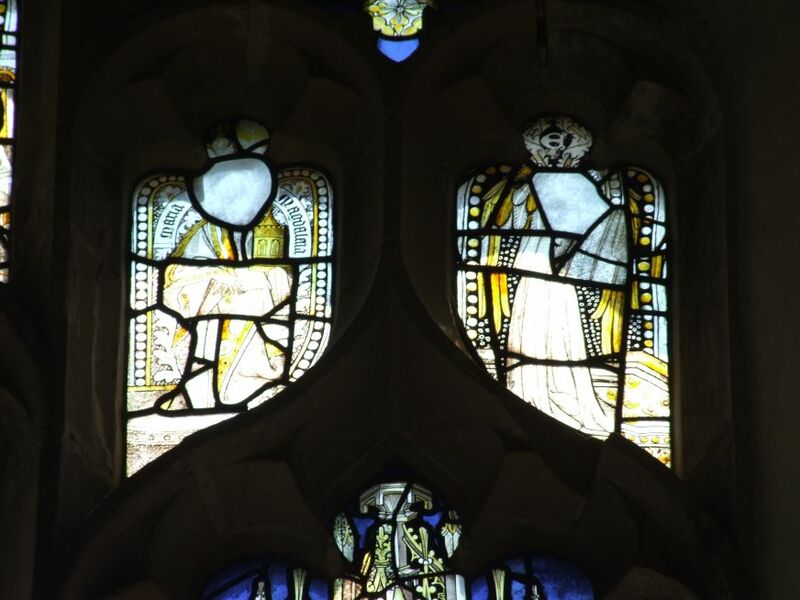 Those in the north side of the nave look so similar to some of the fragments incorporated into the east window at Yaxley that I wondered if they might have come from the same collection. But perhaps the most interesting survivals here are more recent. In the south aisle, a huge picture shows the Worlingworth feast on the occasion of the Golden Jubilee of George III in 1810. The church you are standing in can be seen to the left. If you look closely, you'll see an ox being roasted on a great spit. Turning to the north west, you can see the spit itself leaning up in the corner. Since my last visit, the painting has been joined by another, depicting the Golden Jubilee feast for Elizabeth II in 2002. How's that for continuity? In front of the spit is the famous Worlingworth fire engine, dating from the year of George III's accession, 1760. Once, these were a common sight, in churchyards or in the yards of stately homes. Mortlock says that this one was last used on Guy Fawkes Night, 1927. On it is the name of the makers, Newsham and Ragg of Cloth Fair, in the city of London. 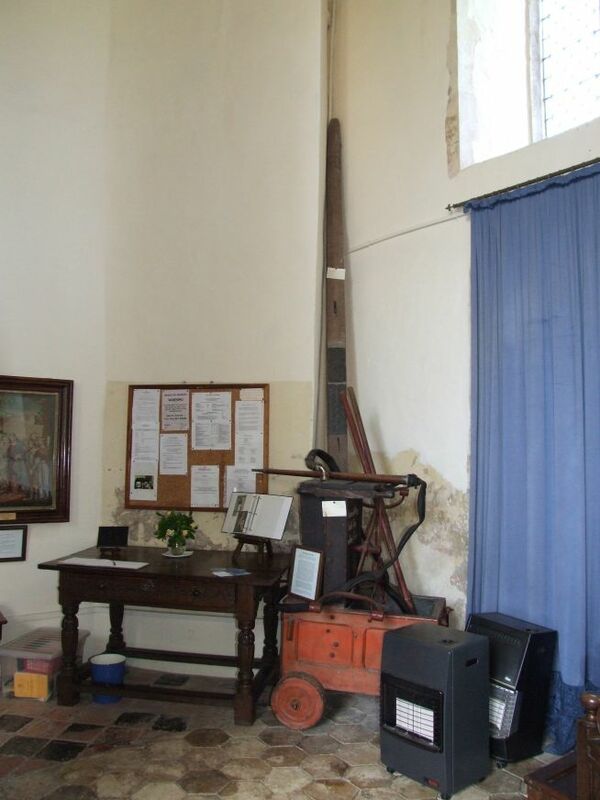 I happened to know that Sir John Betjeman had spent the most creative years of his life living in a house in Cloth Fair - I wonder if he knew of the Worlingworth fire engine? 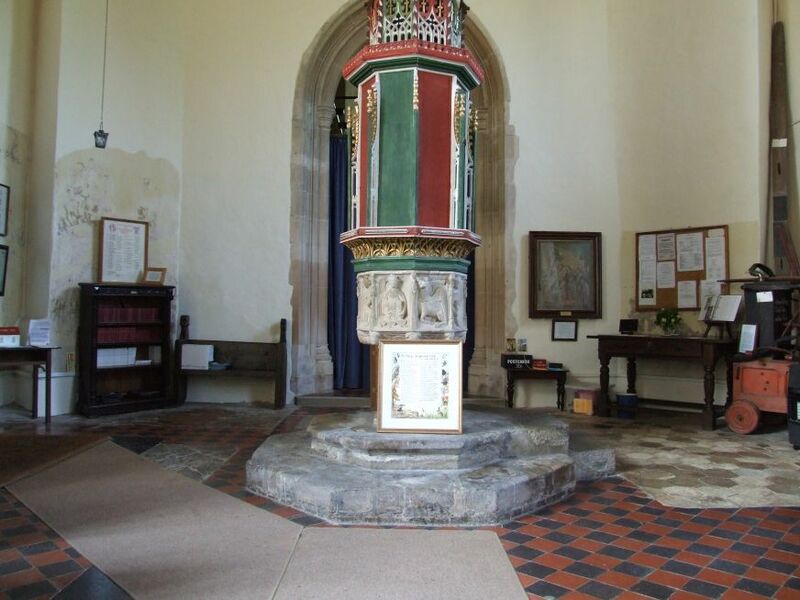 The font cover is famous for its size and decoration. Only Ufford and Sudbury St Gregory surpass it, although there is something particularly lovely about its mannered early-18th Century restoration. The Victorians seemed to think that it had been brought here from Bury Abbey after the Reformation, but there is no evidence for this - in fact, surely the evidence points to exactly the opposite. It must have been designed for the space it now fills. 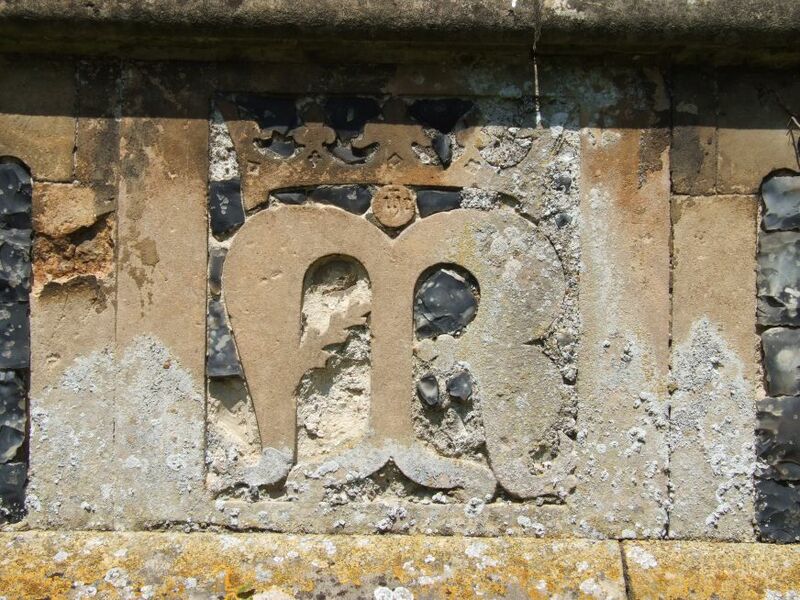 There are so many fascinating little details at Worlingworth that I won't attempt to mention them all. I'd rather give you the chance to find them yourself, or look them up in Mortlock if you'd rather. 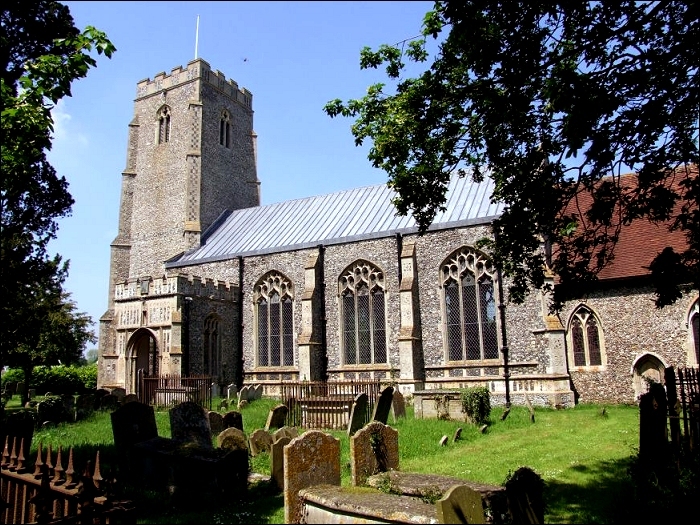 Suffice to say that this is one of the more interesting churches in East Anglia. Highlights include a curious doorway high up in the west wall above the tower arch. 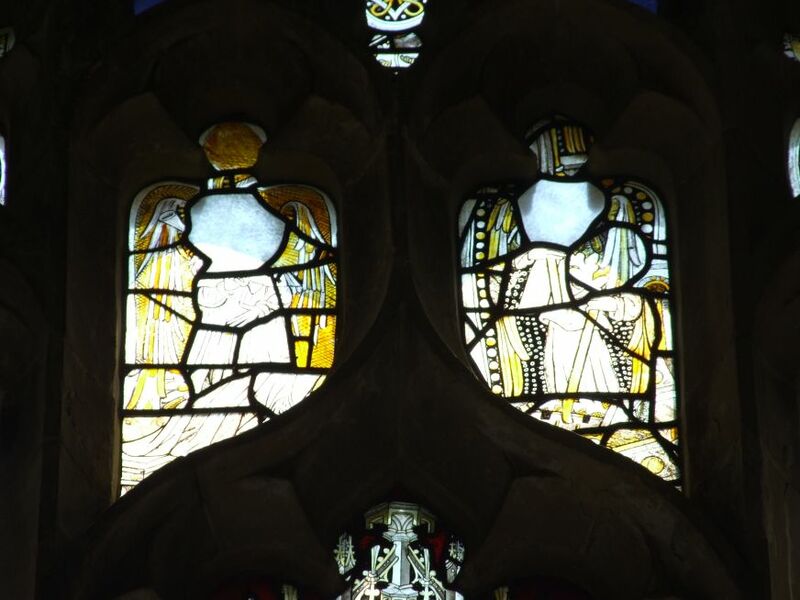 Is it the site of the former sanctus bell window? Perhaps it was remodelled to allow access to a now lost west gallery. 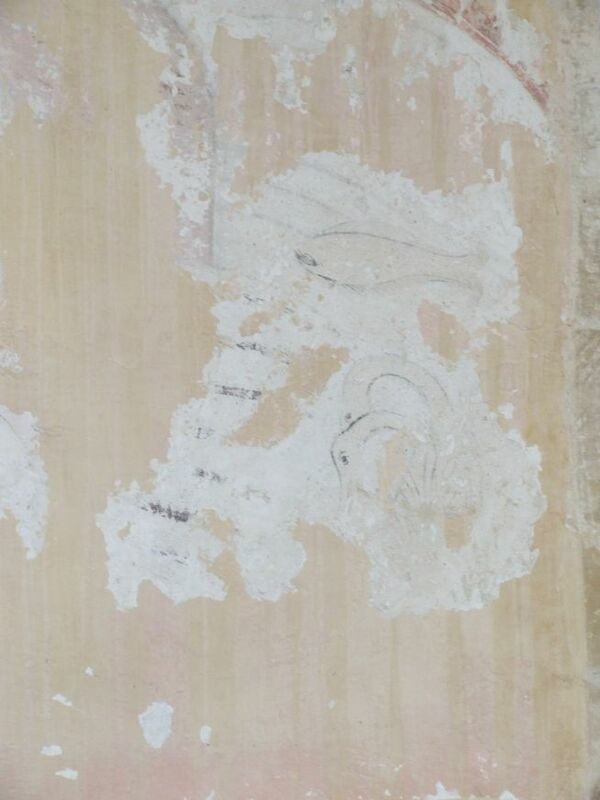 On the north wall, part of the St Christopher wall-painting survives; once, almost every church had one of these. 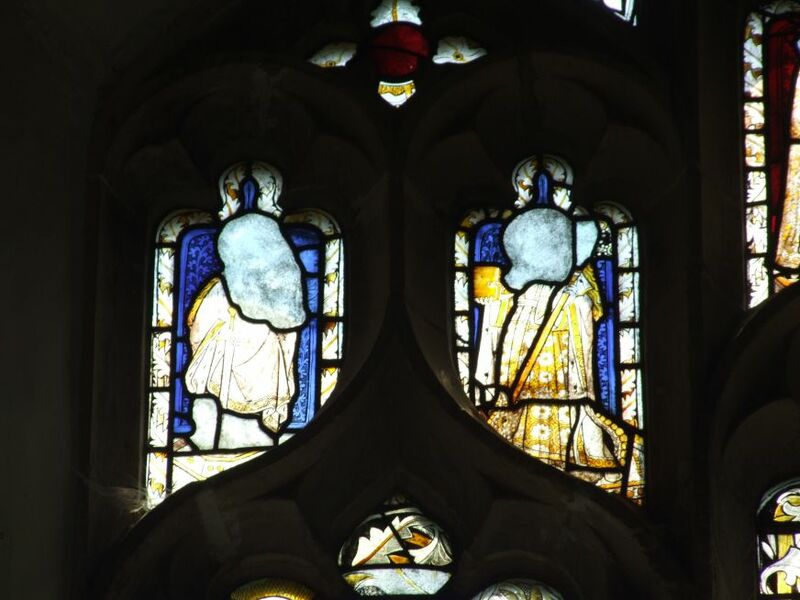 The Saint has gone, but you can still see the fish, going about their business around the Saint's feet. 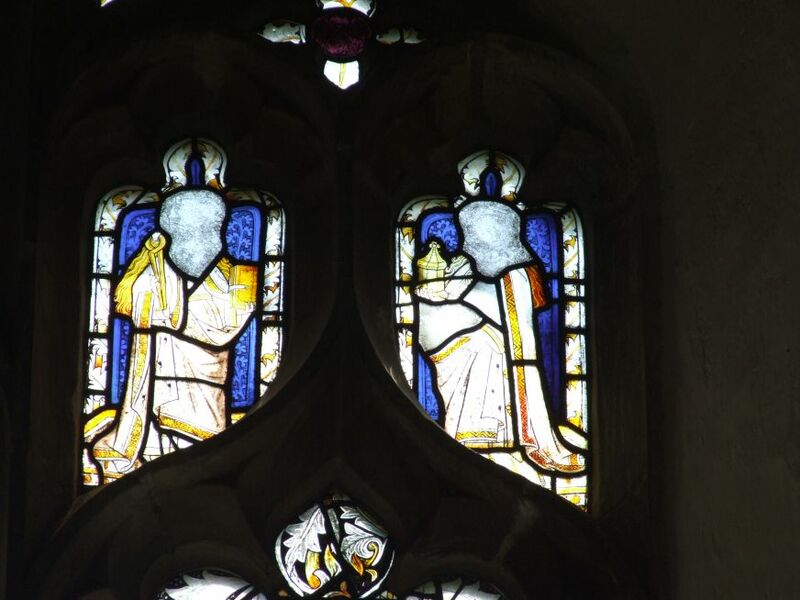 The late 19th century glass in a south window in the chancel is a most unusual subject, depicting Moses descending from the Holy Mountain carrying the Ten Commandments. It is rendered in suitably fiery tones. 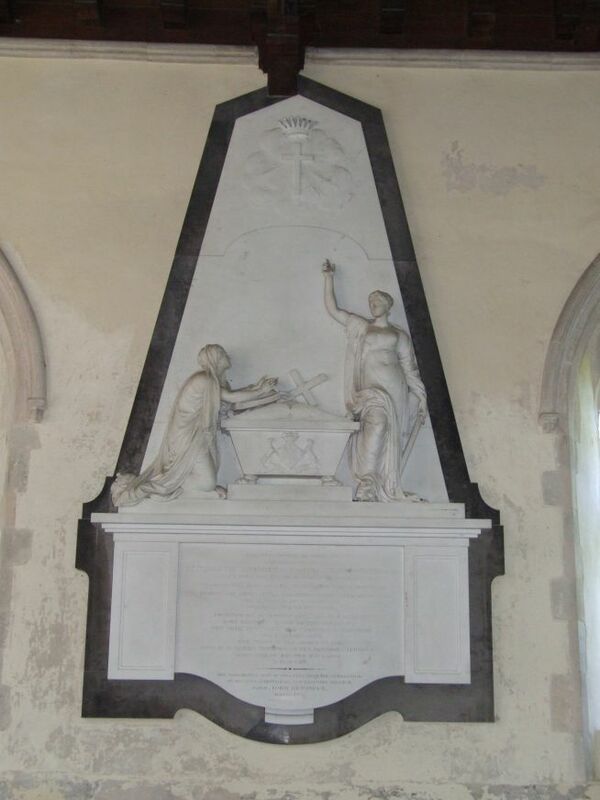 Also in the chancel are some interesting memorials, one depicting Faith and Hope, another made of Coade Stone. 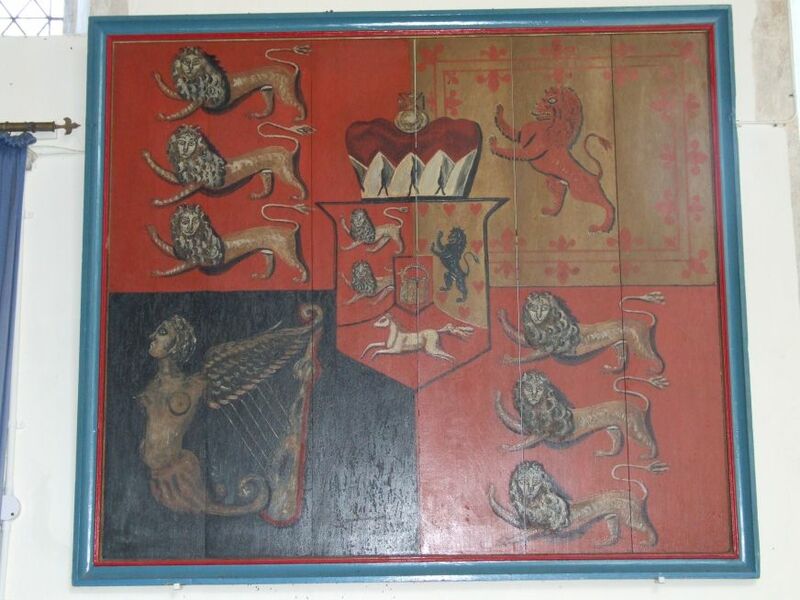 The royal arms consist of nothing other than the charged shield, with no supporters, crest or motto, of George III. 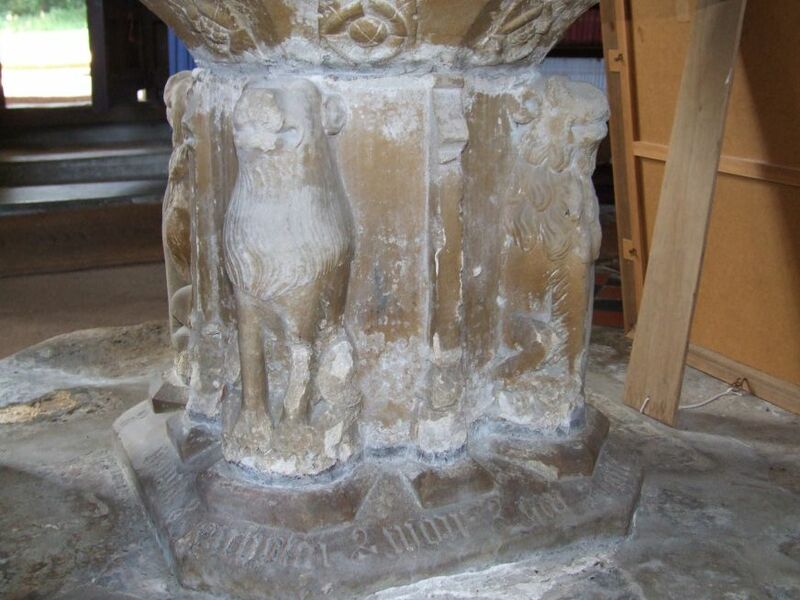 There are some charming and poignant ledger stones around the font. 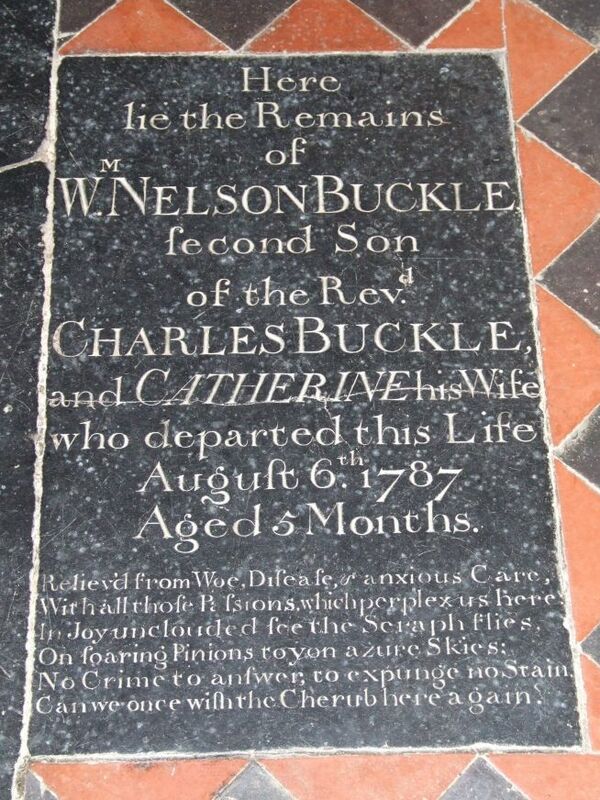 The grandly named William Nelson Buckle, second son of the Rev. Charles Buckle, died on the 6th of August 1787, aged just five months, Relieved from Woe, Disease and anxious Care, with all those Passions which perplex us here... Next to him, James Barker to his dearest wyfe Susanna doth this last office of love, for she was Religious, Chaste, Discreet, Loveing... underneath, added almost as an afterthought, he observes that Her rest gives me a rest-lesse life, because she was a vertuous wyfe. But yet I rest in hope to see that Daye of Christ, and then see thee. 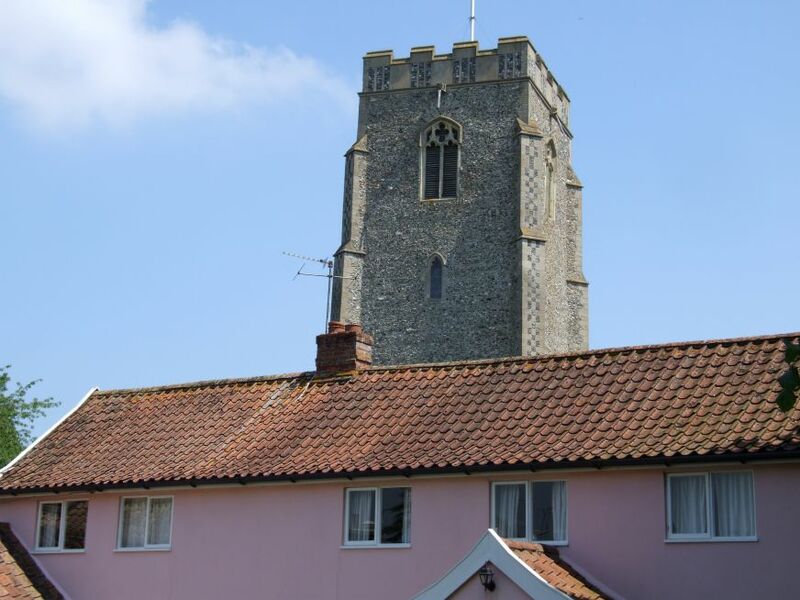 A more recent century has given brass plaque memorials to two men of the French family, rich patrons of this parish, who were killed in action during the First World War. Reverend Frederic French was the Rector of this church, and he lost a son and a grandson, less than a fortnight apart. Noel Lee French, the only son of the Rector's oldest son, Edward, who might one day have been heir to the French family fortunes, was killed in Egypt on the 27th of February 1915. As if this was not unbearable enough, the Reverend French's youngest son, William Cotton French, was killed near Neuve Chapelle thirteen days later, on the 12th of March. The plaques are set apart in the chancel, a large medieval consecration cross keeping one of them company. William Godbold gave the almsbox in 1622; his inscription also survives.